In a household with multiple pets, there always seems to be one fat, greedy one that eats all of the food and leaves the others hungry. 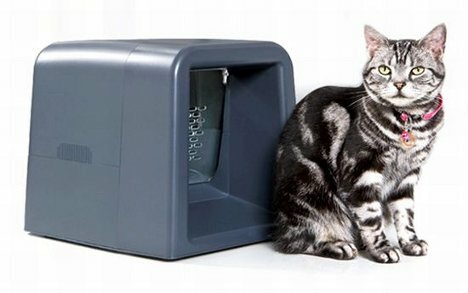 The Gatefeeder is a smart solution that ensures only the right pet gets the food inside. 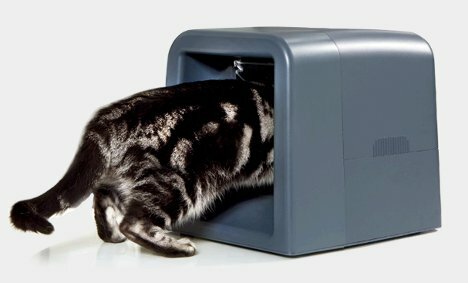 It looks a bit like a tiny version of the covered litter boxes some cat owners use, but there is only enough room for the cat’s head and front legs. Using a special collar-mounted RFID tag, the Gatefeeder determines whether the animal trying to get food is the one authorized to eat there. If the cat is wearing the tag, the door opens and allows access to the food. This design allows pet owners to make sure the right cat gets the right food, but it also lets them put their pet’s food outside without worrying that raccoons or other wild animals will steal the tasty vittles. In addition to keeping the cat food safe, the Gatefeeder can guard medications or special foods – provided you can get your cat to voluntarily go for the medicine or special food. In theory, you could buy a separate Gatefeeder for every can in your house, but at $249 each it would be much cheaper to just put them in separate rooms and shut the doors at meal time. See more in Home & Personal or under Gadgets. December, 2012.